Just stayed the one night. Love,y surroundings, super comfortable bed with great bathroom. The breakfast was included and was very good. Not sure if the spelling is right but Ivreen who took us on the house tour was fabulous and super friendly. Perfectly located for the hop on hop off city tour and downtown Natchez. Booked through booking.com and got a great price. This is an exquisitely beautiful property with excellent service. The room was huge - a romantic bedroom with a separate sitting room. So why the so so rating? The room was musty - maybe a little moldy. And we had planned to eat there, but when we arrived we were told that the regular restaurant was occupied with a private party, but were given the option of eating at a communal table with other guests and a very limited menu. We did enjoy the other guests, but the food was so so. They did go out of their way though to accommodate my husband's dietary needs. What I loved most about the property were the gorgeous grounds, really enjoyed walking around and just sitting outside. So all in all, mixed. Very welcoming staff & very helpful, they very kindly changed our room from a cottage to a beautiful room in the main house. We had a good meal in the main house , not a very extensive menu, so only had one meal there. The location is good for Natchez, & other Plantations. The gardens are worth a good explore. We had a late dinner here while staying at another property in town. Th atmosphere is pretty and historic as you would expect. The food was good but the menu was limited. A bit pricey for what we got but overall nice experience. We stayed in one of the small cabins. Very quiet and the bed was comfortable. The furnishings were antiques and replicas. The bathroom contains a whirlpool bath. The staff was uniformly excellent. Housekeeping was flawless. Cleanliness was top-notch. No small children allowed. Complimentary hot breakfast in the beautiful Garden Room. The gardens and grounds are expansive, well maintained and gorgeous. There are two ponds; one is crossed by a foot bridge. The main house contains guest rooms on the 2nd floor. Most of the rooms are in detached cabins, containing 2 or more rooms. The ground floor of the main house includes the excellent Restaurant 1818, along with the Quitman Lounge and a separate study. Furnishings in the main house consist of antiques, beautifully framed artwork and exquisite chandeliers. 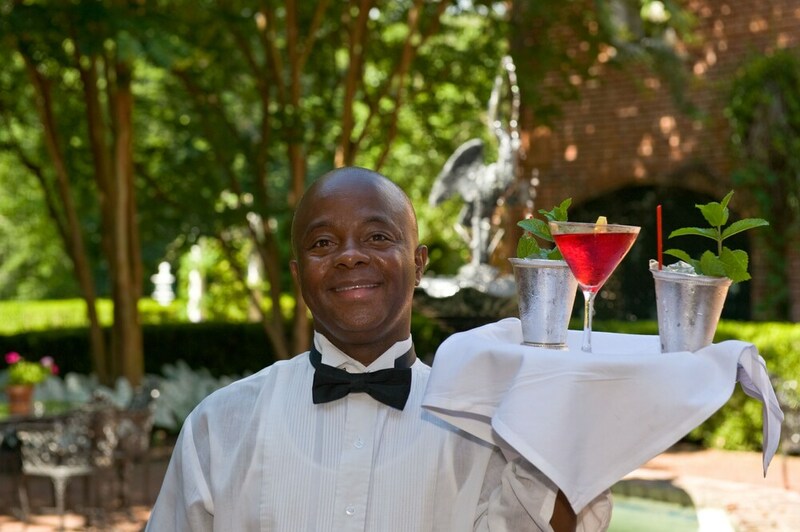 Among the excellent staff, bartender Roosevelt Owens in the Quitman Lounge makes the best mint juleps you have ever tasted. We reserved the best room available as told by the management. Upon arrival, we were directed to the carriage house # 37. The supposed “bellman” went by golf cart to the room ahead of us and promptly pointed to our upstairs room never offering to help us with the luggage...this should have been our first clue! When we entered our “suite” we were greeted by a musty smell and this was followed by the sound of something running across the ceiling in the attic. Then we surveyed the two rooms which was covered by old and stained carpeting. The bed was not even a Queen and you could sink halfway to the floor in it. We then called the front desk to complain and were told the Inn was full that night. Management stated they would call if something became available. We received no updated information nor an apology. So the moral of this experience....you may book a reservation at the restaurant and have a great meal as we did but stay somewhere else. You had me at Deep Fried Stuffed French Toast! Our service was excellent and the meal was wonderful. No Diet Coke but the juices were nice and the food made up for it! While in Natchez celebrating our anniversary, we stayed at Monmouth. It has all the luxuries of a fine hotel, with the character and ambiance of a bed and breakfast. Our room, the Andrew Jackson room, was not in the main house, but above what was the kitchen when the house was originally built. There was a balcony on one side that overlooked the lovely grounds, and a window that overlooked the courtyard on the other side of our room. The room was decorated with period furniture, but very comfortable and clean... when I see photos of draperies around a bed, I automatically assume they're dusty, and fortunately, that was definitely not the case. The bathroom was updated with the modern luxuries you'd expect to enjoy at any nice hotel. We had a lovely view of the courtyard on one side of our room, and a view of, and balcony overlooking the gardens on the other side of our room. Included in the stay was a free breakfast and free tour of the house. The breakfast consisted of two eggs, cooked to our liking, a biscuit, grits, our choice of meat, fresh fruit and cereal. It was all delicious. Breakfast is served in the beautiful restaurant at the back of the property. Wendy gave a group of us the house tour, which was interesting and informative and lasted about 45 minutes. There were a few miscellaneous decorative pieces in the house that belonged to the Quitman family, and two stunning Waterford gasoliers. During the tour, we learned the story of the Quitman family. John Quitman was a General in the Mexican-American War, who later served in the Senate and as governor of Mississippi. Most inspiring was the letter he wrote to his wife, Eliza, declaring his love for her while he was off fighting the war. We were free to walk the beautiful grounds and relax. In addition to the courtyard, there was also seating in adirondacks around the pond, rocking chairs on the balcony by our room, and a gorgeous trellis that's covered in wisteria (which wasn't in bloom but I can only imagine how breathtaking it must be when it is in bloom). Complimentary h'ors d'oeuvres were served between 5:00 and 7:00 in the Quitman Lounge. We missed them by a hair, but did enjoy a mint julep and small talk with George, the bartender. He's a treasure! We've found our new favorite place to stay in Natchez! The Monmouth Historic Inn is like no other! First off the grounds are absolutely beautiful! To stroll around them certainly takes you back in time. The room was everything you hoped it would be! Sheer elegance. There was both a shower and hot tub in our bathroom. The furniture was elegant. Needless to say the room was spotless. The staff were super attentive and very sweet. Our breakfast the next day was in a totally different garden building. It was very quaint. I had French Toast and it was the BEST I have ever tasted. Roosevelt manned the bar and he did a great job. Keep up the good work Roosevelt. Best stay! Check it out. Beautifully restored antebellum house in wonderful gardens. Our room was in a building outside but was clean and comfortable with a small patio. It was lovely to relax and take in the surroundings. Breakfast was great. I only had fruit and yoghurt but it was fresh and beautifully presented. A couple of slight negatives however. On arrival a gentleman showed us to our rooms. Help with bags was not offered and would have been appreciated. Staff were fine overall but not especially friendly or engaging which surprised me as different from most places we stayed at this trip. Monmouth Historic Inns and Gardens places you within a mile (2 km) of Auburn Museum & Historic Home and Natchez National Historical Park. This 30-room, 4-star inn has conveniences like 2 restaurants, free breakfast, and free in-room WiFi. Start your day off right with a free cooked-to-order breakfast, served each morning from 7 AM to 10 AM. Enjoy dining at one of 2 onsite restaurants including Restaurant 1818, which specializes in regional cuisine. Savor a meal from the comfort of your room with room service, or make new friends over drinks at the bar/lounge. A TV comes with cable channels, and guests can stay connected with free WiFi. Pillowtop beds sport premium bedding and the bathroom offers a soaking tub, a hair dryer, and designer toiletries. Other standard amenities include a sofa bed, free bottled water, and a phone. Guests of Monmouth Historic Inns and Gardens enjoy access to free WiFi in public areas, a business center, and coffee in a common area. Front-desk staff can assist with concierge services and dry cleaning/laundry. Other amenities at this boutique inn include free newspapers, wedding services, and a garden. Free cooked-to-order breakfast is served daily from 7 AM to 10 AM. Restaurant 1818 - Restaurant specializing in regional cuisine. Open select days for dinner. Alfresco dining available (weather permitting). Quitman Lounge - Cocktail bar specializing in regional cuisine. Open daily for dinner. Alfresco dining available (weather permitting). The preferred airport is Jackson, MS (JAN-Evers Intl. ): 113-min drive, 110 mi/177 km.